The Dark Ages are brought to life in a long standing festival, two coming-of-age musicals hit the stage, and the “magical” connection between music and animation fill this week’s calendar with a mix of music and history. 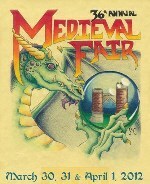 The 36th Annual Medieval Fair takes place in Norman this weekend. From March 30th through April 1st, the “living history fair” takes over Reaves Park at the corner of Jenkins Avenue and Constitution. A variety of acts entertain onlookers at seven stages, 200 artists and vendors sell everything from metal goods to wooden roses, and Medieval Fair food is in abundance. The New Riders of the Golden Age host jousting performances daily at 11:30 a.m. and 3:15 p.m. Human Combat Chess Games happen at 1:00 and 4:45 p.m. by the Arthurian Order of Avalon. Bag piping and traditional music by Brizeus and sword combat with The Dualists are new performers to this year’s fair. As always, the Medieval Fair is open to the public. Lyric Theatre Oklahoma’s next production is a unique coming-of-age story. “Spring Awakening” is a rock and roll musical adapted from German playwright Frank Wedekind’s work from 1891. It was a controversial play in the early 1900s and was often banned or only allowed limited runs. The musical adaptation premiered in 2006 off Broadway. Since then, “Spring Awakening” has received eight Tony Awards including one for Best Musical. It is intended for a mature audience due to subject matter and language. Lyric Theater’s performances are from March 28th through April 14th at The Plaza Theatre in Oklahoma City. Students from the Studio of The Sooner Theatre perform “Footloose” on Friday, Saturday, and Sunday. The 1984 film starring Kevin Bacon is based on events that happened in the small town of Elmore City, Oklahoma. It became a stage production in 1998 with two years of success on Broadway. The cast, ages 12 to 18, put their own twist on the musical in Norman with musical direction by Ian Z. Gill and choreography by University of Oklahoma student Corey Lingner. The University of Oklahoma School of Music hosts “The Magic of Music” on April 1st in the Catlett Music Center. This multimedia concert compliments the Fred Jones Jr. Museum of Art’s exhibit “A Century of Magic: The Animation of Walt Disney Studios.” Beginning at 1:45 p.m., children ages 12 and under can sign up for the Disney Costume Parade and Contest. The concert begins at 3:00 p.m. and features musical works from the films “Fantasia” and “Fantasia/2000” such as Tchaikovsky’s Nutcracker Suite and Beethoven’s Pastoral Symphony. During the concert, guest artists and students from the School of Art and Art History create spontaneous art inspired by the music. The Fred Jones Jr. Museum of Art hosts a reception following the performance. Other musical events in the metro can satisfy any taste. The Civic Center Music Hall and Oklahoma City Philharmonic present an evening of “Sumptuous Strings” featuring violinist David Kim March 31st as part of its “Classics” series. The El Reno Rotary Benefit Folk Concert showcases the local flavor of indie music on April 2nd at the Center Theater. Brown Bird with special guests The Dizzy Pickers and O Fidelis perform. The Oklahoma City Jazz Orchestra performs its last concert of the 2011-2012 season on April 2nd in the Chase Tower in Oklahoma City. The show features works by Count Basie, Buddy Rich, Quincy Jones, and more.